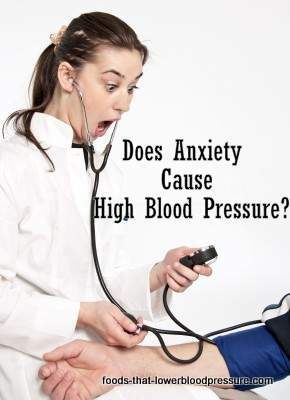 Anxiety has a complicated relationship with high blood pressure. While it may be not as dire as some people think, it does indicate a need to ensure that your mental health is taken care of. High blood pressure (hypertension) is a serious problem. It dramatically increases your risk for heart attack, heart failure aneurisms, and more. Managing hypertension is extremely important for anyone that notices they have high blood pressure, especially if that pressure is high enough to require constant medical attention. Doctors recommend several changes that people should make in order to control their blood pressure. Dietary changes and food choices are of course a priority, as is exercise (if possible). But one thing you may also want to manage is your anxiety. The good news for those suffering from constant, generalized anxiety is that there is currently no evidence that daily anxiety causes high blood pressure. Some scientists believe that the body adjusts to high blood pressure from stress over time, so that even though stress itself is a blood pressure trigger, when that stress becomes chronic the body adjusts your blood pressure to compensate. This is possible when the blood pressure isn’t caused by clogged arteries or other serious ailments. The body can’t generally lower blood pressure on its own, but it does appear to have that ability when high blood pressure is caused by anxiety. But anxiety still has the power to cause significant spikes in blood pressure which can be dangerous for those that are at a level of hypertension that is incredibly dangerous, as well as those that struggle with high blood pressure and known heart disease. Because many people living with hypertension have anxiety because of their own health fears, there is ample reason to ensure that you’ve learned coping tools to reduce the likelihood of those blood pressure spikes. There is also some belief among experts that stress can still increase blood pressure in the long term, and that over time if you experience a constant supply of stress your body will have trouble managing your blood pressure in the future. The American Heart Association shares this view. They state on their website that although stress isn’t known to cause chronic high blood pressure (because of the ability of the body to adapt), it does play a role in general wellness, and that – in turn – means that it could have long term implications for your hypertension. In addition, anxiety is known to change behaviors. Anxiety makes you less prone to exercise, may cause you to eat worse foods or digest those foods poorly, and may limit your healthy activities. Since all of those are known to be important tools for fighting the likelihood of high blood pressure, this would seem to confirm that in a very roundabout way, anxiety can still contribute to hypertension. Anxiety reduction shouldn’t be seen as an alternative to smart eating and exercise. Although anxiety doesn’t appear to be a component in chronic hypertension, temporary blood pressure spikes that it may cause can still lead to higher risk of stroke and heart attack. These spikes can raise blood pressure to dangerous levels in people with chronic hypertension. Anxiety has many profound impacts on your body, so it should not be ignored. Long term stress is indicated as a potential risk factor for ill health, and anxiety reduction is an important tool for managing stress, and ensuring that you’re more active and willing to make the changes necessary to fight your high blood pressure once and for all. About the Author: Ryan Rivera has worked with many people suffering from anxiety fears over their hypertension. You can read more about anxiety reduction at www.calmclinic.com.